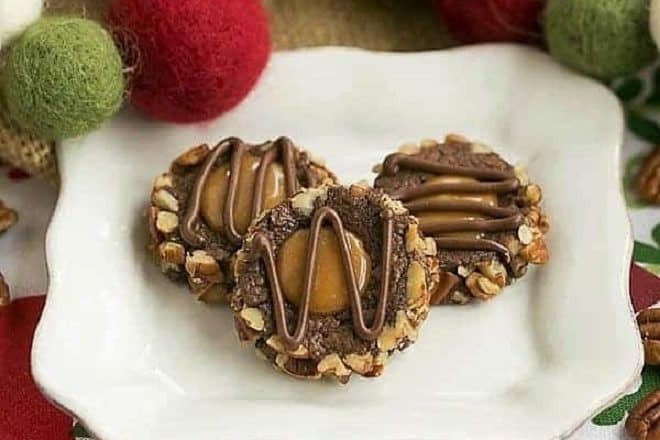 These Turtle Thumbprint Cookies are rich chocolate cookies filled with caramel and topped with a pecan half or a chocolate drizzle. A wonderful addition to your holiday cookie tray! Have you started your holiday baking? I’ve stocked up on butter, flour and sugar and will crank up the oven this week. But I had to plan ahead for this year’s Food Blogger Cookie Swap, so I baked up some turtle thumbprints to send to 3 fellow bloggers! 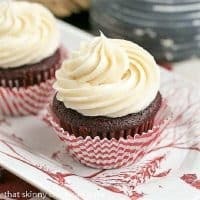 My recipients were Coleen, The Redhead Baker (and fellow Sunday Supper blogger! ), Lissa of The Flourishing Baker, and Kristen of Babcakes Bakery. I packaged up a dozen each of these turtle thumbprint cookies and sent them on their way. Within days, MY cookies began arriving. I received a box of amazing Fruit Cake Cookies from my friend, Erin, of The Spiffy Cookie, some outrageously delicious Triple Chocolate Peppermint Cookies from Jamie of The Gaited Baker, and last, but not least, delectable Moravian sugar cookies from another dear friend, Janet, of From Captain’s Daughter to Army Mom. Such a fun event! 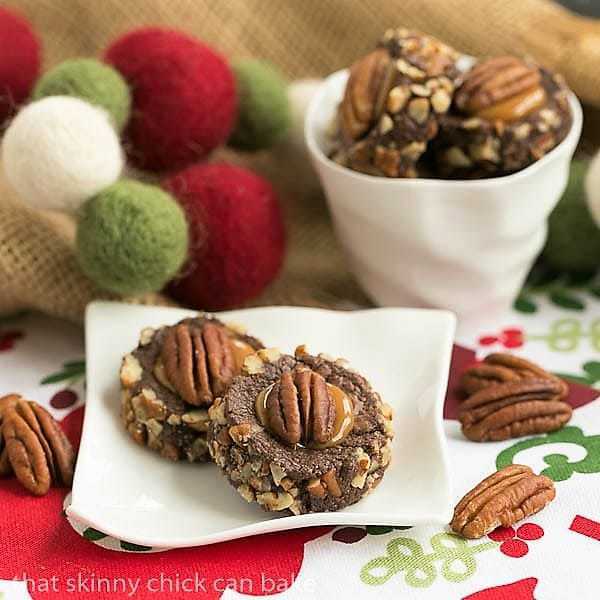 A log of chocolate dough was rolled in chopped pecans then sliced into rounds. Once baked, an indentation was created in the center of each cookie with a thumb or handle of a wooden spoon. The well was then filled with melted caramel when the cookies cooled. I like to wrap my log of cookie dough in plastic wrap, then place it in an empty paper towel tube to help maintain its shape. Store in the refrigerator if you plan to bake these up withing a couple days, or double wrap and store in the freezer to use later. To defrost frozen cookie dough, just place the log of dough into the refrigerator and let defrost overnight. Paint your log of dough with whipped egg whites to help the nuts adhere to the exterior of the dough. To slice these slice and bake cookies, use a sawing motion instead of pressing down through the dough. Pressing down can cause your dough to compress and you’ll have oval cookies instead of round cookies. To create an indentation in each cookie, carefully press your index finger or thumb into the center of each cookie as they come out of the oven. 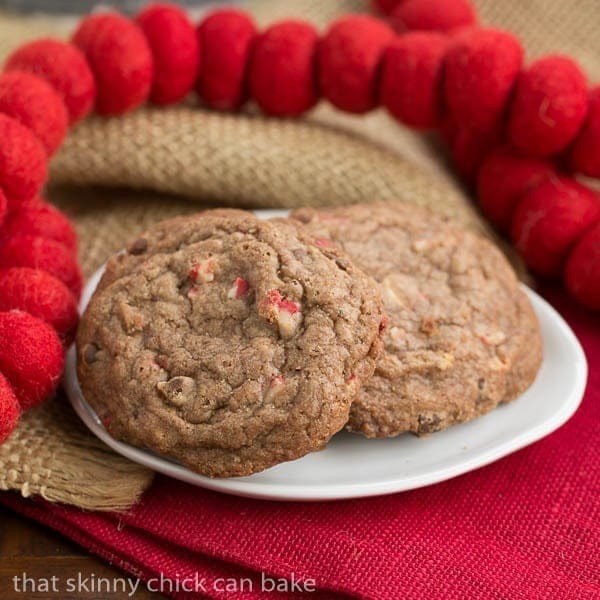 I used the back of a spoon as these cookies are HOT! 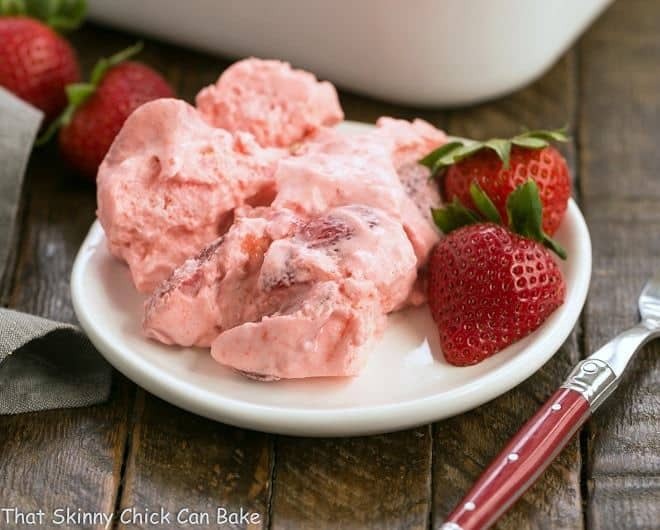 Let cool, then fill and garnish as desired! How to finish these turtle thumbprints off is up to you. I drizzled half with melted chocolate chips using my new OXO Silicone Decorating Bottle Kit. It worked like a charm! The rest I topped with a toasted pecan half…which could also be drizzled with chocolate for the FULL turtle experience. 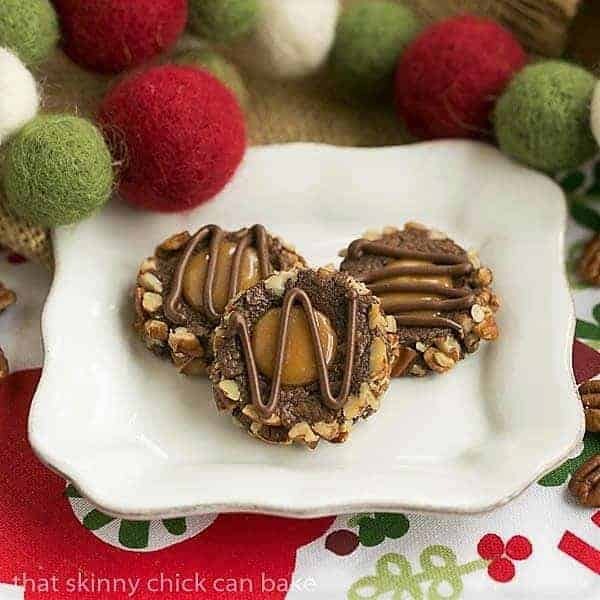 Chocolate thumbprints rolled in pecans and filled with caramel! Beat together butter, sugar, egg yolk, milk and vanilla until well blended. Sift flour, cocoa and salt into batter and mix on low speed till well combined. Form dough into two logs, each 8 inches long. Whisk egg white till frothy. Paint logs with egg whites and roll in pecans. Wrap in plastic wrap and chill at least 30 minutes. Preheat oven to 350º. Line two baking sheets with parchment. Cut each log into 16 slices (each about ½ inch wide). Arrange on baking sheets, about 1½ inches apart. 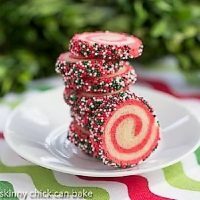 Use fingers to reshape each cookie back into a circle if needed. Bake 10-12 minutes. Remove from oven and immediately press center of cookies with finger or end of spoon to make an indentation in each cookie (I used the flat end of a whisk). Allow to cool completely. Melt caramels and milk in microwave (about 60 seconds or less). Stir till smooth. Spoon a bit of caramel into the center of each cookie. Allow to cool till caramel is set. Melt chocolate chips and place into a ziplock bag. 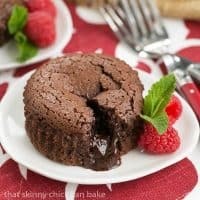 Snip off a corner and drizzle chocolate over each cookie. Or you can skip the drizzle and top each cookie with a pecan half. You always make the best baked goods, Liz! I love turtles and these would be the perfect addition to any holiday cookie platter or party spread! 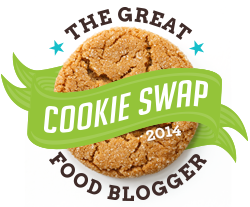 i had so much fun participating in the Food Blogger Cookie Swap too! i would have loved these. 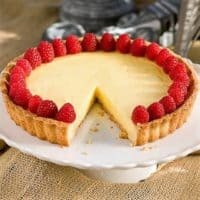 and how great that they are a type of slice and bake thumbprint. i’ve never seen that before! 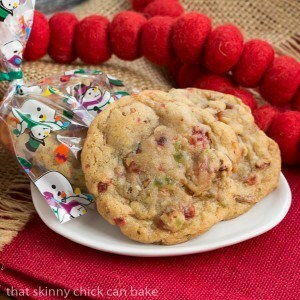 I’ve always wanted to make these cookies, they look absolutely divine! 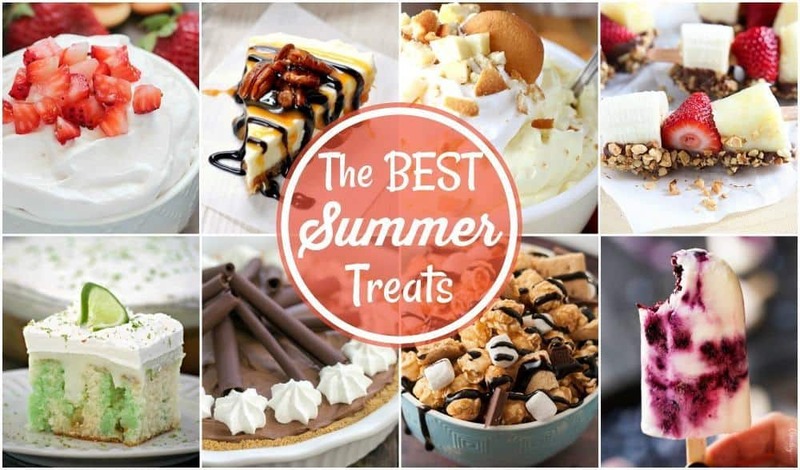 Love thumbprints, love turtles…these look amazing! I think I need these in my life. 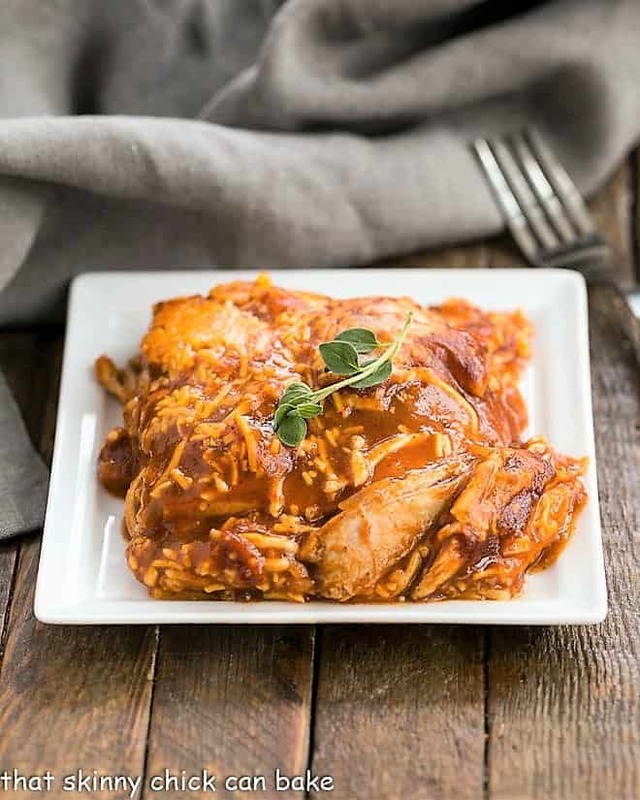 A perfect combination of flavors and textures. My husband would especially go crazy for these cookies. Awww these cookies look super duper cute. And your pictures make me crave for cookies and it’s almost bedtime. I might steal a bite, then. These are some of the best looking turtles I have ever seen. Delicious. It sure would be fun to receive a package of those cookies! What a great holiday treat. These turtle thumbprints look incredible, Liz! Your recipients are so lucky, they must have devoured this batch in no time!